​Fresh, seasonal, locally sourced ingredients go into our delicious and nutritious meals each week. We partner with Farmer's Markets, local butchers, and fellow culinary enthusiasts to ensure that only the best ingredients make it to your dinner table. ​Our mission is to create vibrant, healthy, flavorful meals using seasonal ingredients for a sophisticated mix of both gourmet and comforting dishes. ​We take pride in providing superior dishes for you and your family to enjoy throughout the week. ​Customized cooking is our specialty. We want to satisfy your taste buds and meet your dietary needs. No fat, low-fat, dairy free, and gluten free meals are always on the menu. Allergies? Let us know and we will accommodate you and your family. of finding time to cook and prepare healthy meals for you and your family. 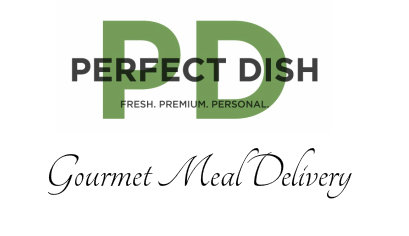 Perfect Dish takes some of the stress off your plate by bringing healthy & convenient fully cooked gourmet meals direct to your door! WE plan. ​WE shop. ​WE prepare. ​WE deliver. ​YOU enjoy every last bite!